Explore the incredible Arctic wilderness and Inuit homelands of the Torngat Mountains. Share and learn with Arctic researchers, Inuit leaders, Elders, musicians, writers, artists, and international visitors. Learn and share traditional Inuit skills, knowledge, and customs. Discover strengths, and develop leadership and employability skills. Share their stories through music, art, writing, photography, video, and/or storytelling. Build new friendships and connections that last long after the summer itself! Core activities of the program promote traditional knowledge; inclusivity; cooperation; self-care; volunteerism; healthy lifestyle choices; connection to the land; and continued education through experiential learning. Traveling by speedboat, zodiac or longliner to historical family homelands and/or culturally significant sites. Assisting the Nain Research Centre, Parks Canada, and other research groups with terrestrial and aquatic fieldwork. Harvesting, preparing, and sharing traditional foods with all visitors and staff of the Base Camp. Drum dancing and throat singing workshops and collaborative performances. Hiking to waterfalls, glacier fed lakes, and nearby peaks with inspirational views. Cleaning and preparing seal skins with Elders. Identifying tundra plants and learning about their traditional uses with visiting biologists and Elders. Carving bone, antler, or soapstone creations together with regional Inuit artists. 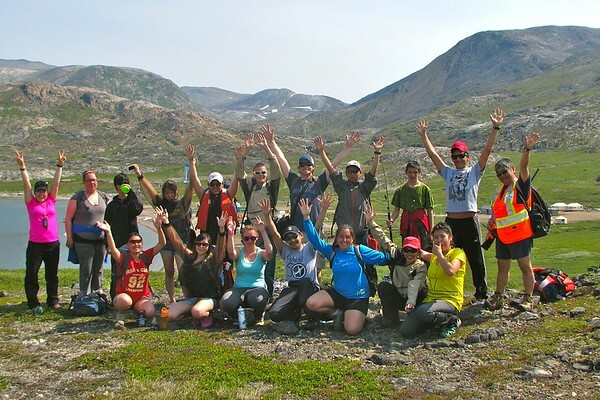 Mentoring opportunities with kANGIDLUASUk Student Program staff, Base Camp staff, Elders, researchers, Parks Canada staff, and other guest instructors and experience providers. Creative expression and reflection through photography, videography, writing, music or art workshops and projects. Guest instructors, artists, musicians, writers, researchers, and Elders involved in the program vary from year to year making each summer a unique experience. Be between 14-20 years old at the time of the program. Be a beneficiary of the Labrador Inuit Land Claims Agreement or; be a beneficiary of the Nunavik Inuit Land Claims Agreement and live in Kangiqsualujjuaq. Demonstrate an interest and enthusiasm for learning, meeting new people, and spending time on the land. Be comfortable spending two weeks outdoors in a remote camp setting. Demonstrate an interest in the environment, adventure, and Inuit Culture. Click here for more information and to download an applications for our 2015 summer program.